Berkley Prime Crime, 9780425247594, 294pp. "Wedding bells are ringing in Fort Connor, Colorado, and the House of Lambspun knitters are abuzz with excitement. 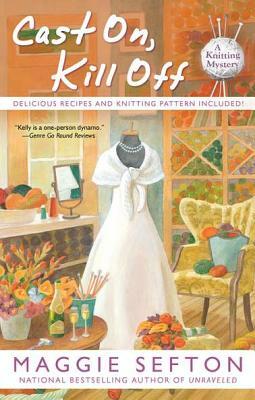 But when a murder interrupts the wedding planning, Kelly Flynn will have to solve this crime fast to ensure the killer doesn t wind up on the guest list "
Kelly Flynn's knitting pal, Megan, is about to get hitched, and all the planning is falling into place. Megan has found the perfect seamstress, Zoe Yeager, to create the dresses for Kelly and the other bridesmaids. And each bridesmaid is knitting her own loose-knit shawl to drape over the lovely dresses. But Zoe has more than bolts of fabric and seam-cutters stashed away in her shop she's harboring a secret. Bruises on her face show a troubling side of her marriage, and just after she finds the courage to leave her husband, Zoe's found dead from a single bullet shot. Maggie Sefton was born and raised in northern Virginia, where she received her bachelor s degree in English literature and journalism. Maggie has worked in several careers over the years, from a CPA to a real estate broker in the Rocky Mountain West. However, none of those endeavors could compare with the satisfaction and challenge of creating worlds on paper. She is the mother of four grown daughters, currently scattered around the globe. Author of the nationally bestselling Knitting Mysteries, she resides in the Rocky Mountains of Colorado with two very demanding dogs. “Kelly is a one-person dynamo, and when she sets her mind to something like knitting or sleuthing, nothing can prevent her from achieving her objective." "A darn good series with vivid, breathing characters."